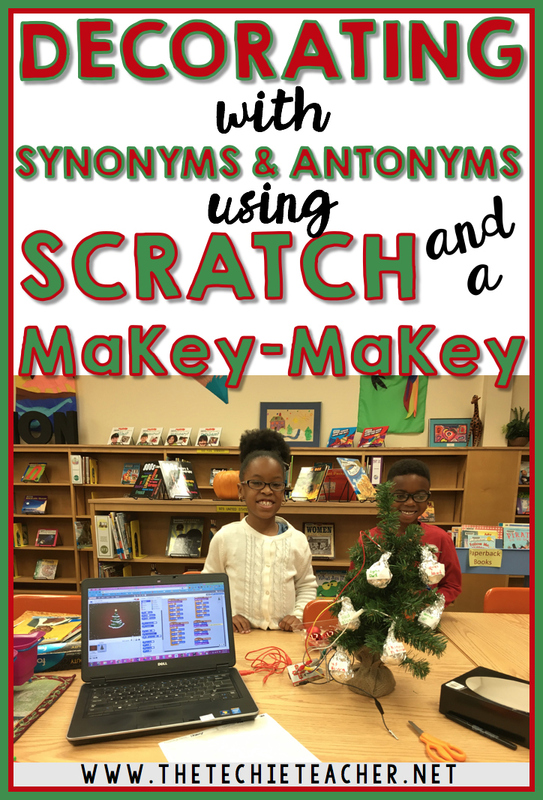 Decorating with Synonyms and Antonyms Using Scratch and MaKey-MaKey | The Techie Teacher® . Earlier this week I worked with 2nd graders who had been learning about synonyms and antonyms. Two weeks ago we did a fun whole group lesson to introduce the topic and on Monday the teacher and I decided to step it up a level and add a holiday flare! I met with a small group to "test out" this lesson idea. The children in the pictures were two students who really grasped the concept so they are going to help me teach the rest of the class the next time I am at their school! First, we used Scratch to program a Christmas tree sprite (character) that we added to a holiday background to dance when synonyms were selected and to turn upside down when antonyms were selected. After I prompted the students to work with a partner to experiment with their code. This was a hard task for 2nd graders but they did it with very little assistance! Before we started decorating the tree, the students needed to finish their Scratch program by recording their voices saying "Synonyms" and "Antonyms". Then the students used sticky labels to write pairs of words that represented synonyms and antonyms. They "decorated" the tree with their words. Each ornament had either a pair of synonyms or pair of antonyms attached. 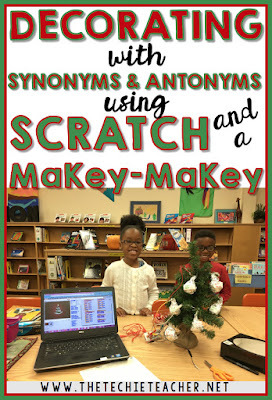 The last step really tested their problem solving skills as they hooked up the MaKey-MaKey to the laptop, connected the wires to the ornaments and matched up the Scratch program with the MaKey-MaKey cords that attached to either an ornament that had synonyms or antonyms. Whew! The kids had a blast testing out their creation. Way to go, 2nd graders!